How can you benefit from LearnPractice.com? 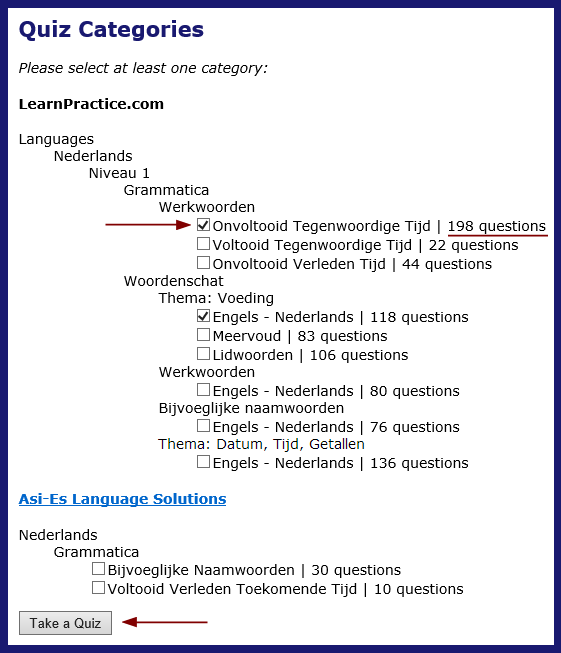 What types of questions are possible in LearnPractice.com? LearnPractice.com is a language practice platform. The objective is to create an exciting and efficient study experience. The system serves questions that target the weaknesses of each student. This is accomplished by tracking the performance of the student. Moreover, the performance of the student is reported to their instructors and employers. The best way to experience LearnPractice.com is to sign up for a free student account and try out the sample exercises. Offer an exciting and efficient study experience to your students. Get insight into the language capabilities of your students. Reach prospective students for offline activities, such as language courses and workshops. Earn royalties by offering your exercises to online visitors worldwide. Instead of offering your exercises on paper, offer your exercises on an online training platform. Your students solve short quizzes of 20 questions. The questions are aggregated from the categories your students choose based on their past performance. They receive instant feedback after every question they answer. They see statistics on the number of exercises they have completed, overall and per category. Moreover, each student has access to the list of the questions they have answered wrongly. You can track their performance on each category. You can also offer the exercises provided by our content providers to your students. In order to build a sustainable business, you need repeat customers and references. That can only be achieved by delivering solid results. In language education, that means a significant improvement of the overall level of your students. You can accomplish that by composing curricula based on the language capabilities of your students. The analytical modules of LearnPractice.com give you an overall insight into the language capabilities of your students as well as statistics on the individual level for each student. Moreover, you can offer usage and performance reports of your students to their employers. By offering a fraction of your exercises for free, you can raise your profile among the registered users of LearnPractice.com. You can offer your exercises to students worldwide as a premium product. You can track how many subscriptions are purchased by language learners worldwide. You can track the performance of each student on your exercises. You have complete control over the content that you provide in LearnPractice.com. You retain all the copyrights of your content. You have complete control over who has access to your content and under which terms. You can remove your content any time you want, as soon as the ongoing subscriptions expire. You are responsible for the copyrights of your content. You can only upload content, which you are the copyright owner of. The students are taken to their profile page when they sign in. In their profile, they can see the list of their exercise categories and the list of the questions they have answered wrongly. The number of total and completed exercises is displayed next to each category. The student selects one or more categories and clicks the "Start" button. The system will prepare a quiz with 20 questions from the selected categories. Fig.1 - In your profile page, you can select one or more categories and take a personalized quiz of 20 exercises. Instant feedback as soon as a question is answered. 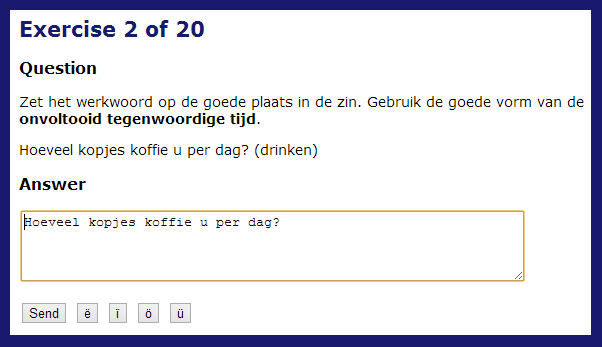 The next question is displayed automatically if the answer is right. Answer the question as many times as desired. Show the right answer and move to the next question. The system keeps track of the questions answered wrongly and serve them with higher frequency. 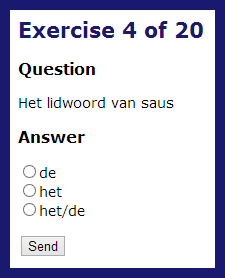 Here are the screen shots of the possible question types in LearnPractice.com. Fig.2 - Fill in the Blank Questions. In this example, you have to conjugate the adjective. Fig.3 - Questions with Short Answers. 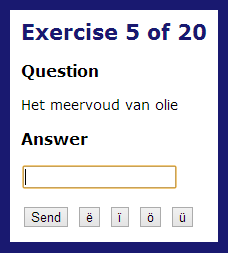 Used for exercises like Dutch translation of an English word or the plural of a Dutch noun. Fig.4 - Questions with One Sentence Answers. In this type of exercises, you have to conjugate the verb according to the given tense and the person form, and then put it in the right place in the sentence. Fig.5 - Multiple Choice Questions. Perfect when the possible answers of a question are limited, such as the article of a noun. Fig.6 - Combined Multiple Choice Questions. This type of questions are more difficult than the multiple choice questions, because you have to select the right answer in both lists and there are more options in the lists. However, they are still easier than the questions with one sentence answers, because the verbs are already conjugated and put in the right place in the sentence. Starting a joint project with LearnPractice.com is a simple decision. With the transparent and free trial periods, you have complete knowledge of what to expect from the system. Email info@learnpractice.com or use the contact form to explore the possibility of a collaboration with LearnPractice.com. What Can Learn Practice Do For You?